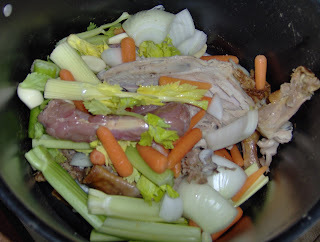 Since I made roasted chicken last night, it's time to make & stock up on some chicken stock today. It's so simple and much more flavorful than the store bought stuff. 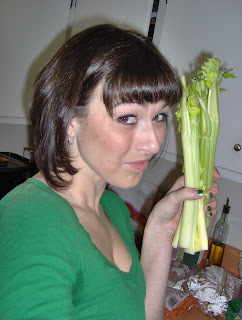 I had some celery that was near the end of it's life - perfect for stock! 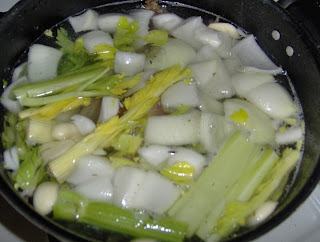 Chop into some big hunks (leaves and all) and toss it in a big stock pot. Peel about 1/2 bulb of garlic & toss that in. 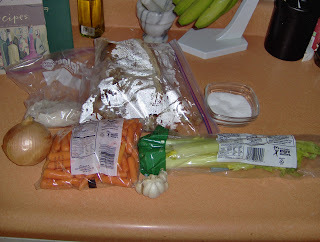 Since my mom is on vacation, I went to her house & cleaned out the crisper...so I have baby carrots this week (which I never buy b/c they are so much more expensive than regular old carrots) - toss in some chopped (or baby) carrots. 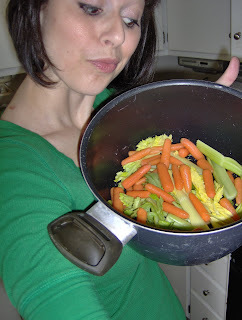 Make sure the carrots are peeled, though. I think the peel makes the stock bitter & not great. Peel & roughly chop up an onion - throw that in too. 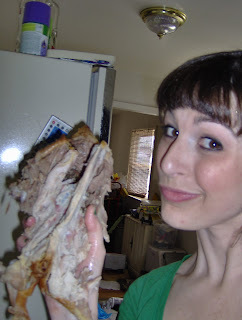 Add the giblets & neck (gross, I know, but they make the stock taste fantastic) and finally the chicken bones/carcass. 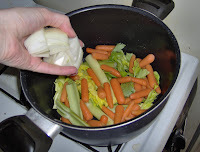 Fill up the pot with water, making sure that all the veggies & chicken are covered completely (I had to switch pots because I forgot about my ginormous stock pot in my other lazy susan). Cover the pot & put on a low flame. Let it simmer for a few hours. It will smell reeeeaaaallly good. After it's all simmered up - taste it. It will need salt. 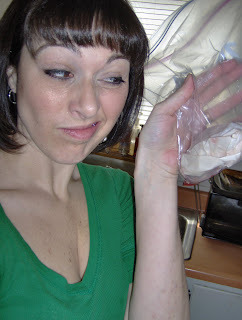 Probably a good 3-4 tbsp of kosher salt. Now strain it. 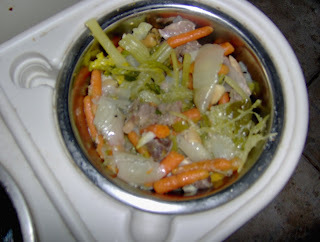 If you have a dog...give him or her the cooked veggies, neck meat, giblets and little chicken bits. They will love you forever. 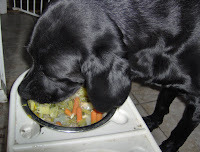 Mr. Trucker had a heaping helping of veggies & chickeny goodness for dinner tonight. Let it cool and then put into freezer bags in measured out amounts and write how much each bag contains (I like to do 4 cups to each bag) I stack them up flat in the freezer so they don't take up much room. 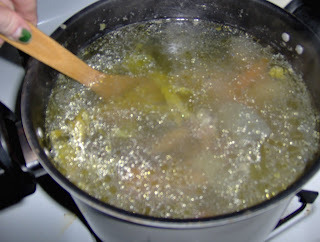 Now you have the perfect starter for soup if you get sick. Also fantastic in risotto...because your risotto is only going to be as good as the stock that you use!